In Prison Profiteers, co-editors Tara Herivel and Paul Wright “follow the money to an astonishing constellation of prison administrators and politicians working in collusion with private parties to maximize profits” (Publishers Weekly). From investment banks, guard unions, and the makers of Taser stun guns to health care providers, telephone companies, and the U.S. military (which relies heavily on prison labor), this network of perversely motivated interests has turned the imprisonment of one out of every 135 Americans into a lucrative business. Called “an essential read for anyone who wants to understand what’s gone wrong with criminal justice in the United States” by ACLU National Prison Project director Elizabeth Alexander, this incisive and deftly researched volume shows how billions of tax dollars designated for the public good end up lining the pockets of those private enterprises dedicated to keeping prisons packed. 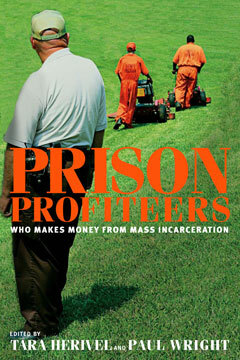 “An important analysis of a troubling social trend” (Booklist) that is sure to inform and outrage any concerned citizen, Prison Profiteers reframes the conversation by exposing those who stand to profit from the imprisonment of millions of Americans.